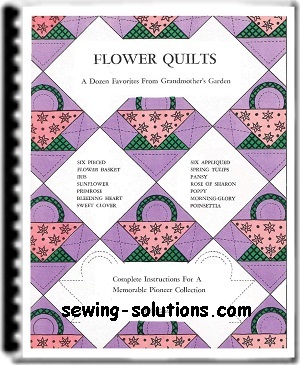 Beautiful flower quilt patterns included the early American quilts, created by the women of yesteryear from small scraps of left over fabrics, have been handed down from mother to daughter and have become more cherished as the years go by. 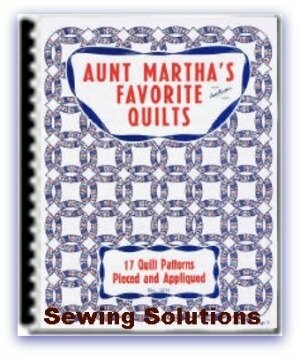 The designs are so lovely and so many that today, as always, they play an important part in the planning of pleasant-looking rooms, for quilts made from these designs harmonize with all types of furniture and color schemes. 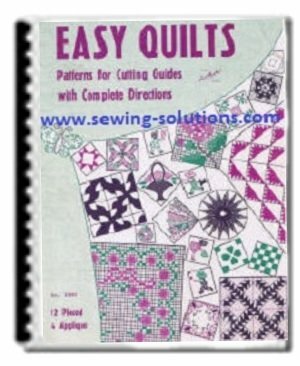 We have one suggestion and that is—use fast-color materials of good quality far you will find that the making of a quilt requires patience and time, and you will want to cherish it for many years. 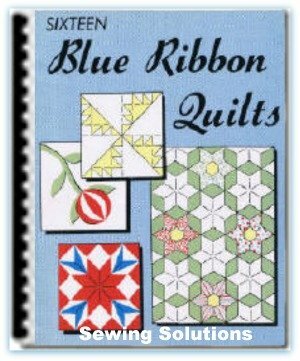 You'll enjoy making this cherished design for yourself or for a daughter's bedroom. The baskets are made of various shades of one color such as pinks, greens, yellows or blues; or make the baskets of red and green calico on a pure white background. Part of the fascination of quilt-making is the romance that is embodied in the quilts made long ago. 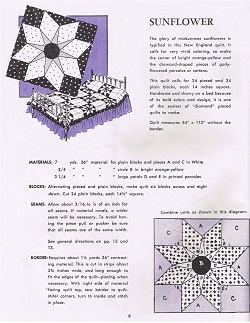 Many single flower quilts—such as this Iris quilt—were bride's quilts. 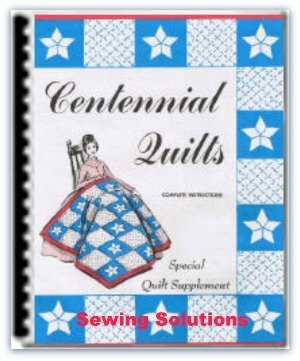 It was con­sidered poor etiquette to ask a bride for a pattern of her quilt which had been designed by her young bridegroom. It was customary to destroy the original pattern so that it would not be copied. The glory of midsummer sunflowers is typified in this New England quilt. It calls for very vivid coloring, so make the center of aright orange-yellow and the diamond-shaped pieces of gaily-flowered percales or cottons. The Primrose is February's flower, so work the quilt in colors that suggest the coming of Spring flowers — yellows, lavender, purple, and greens. The lovely pink, white and red bleeding heart plants that used to grow in country gardens and on country lawns were the inspiration for this colorful quilt. These quaint old-fashioned flowers may be made in pink polka-dotted fabrics or in fine red all-over flowered cottons. Use delicate green-sprigged fabrics for the four-pointed leaf tenter sections. You'll be a lucky person if you own this vivid clover and four-petalled flower quilt. The flowers may be of sprigged yellow or red printed ma­terial, and the clovers of light green or pink material. Or, if you wish, you may reverse the colors—it's the kind of block design with which you like to experiment. When you make a quilt such as this one of Spring Tulips, you are creating something that may be handed down to your children, Many of us cherish very old quilts that we remember our Grandmothers making when we were very young. The deep purple and light lavender of the tulips, the darker green of the leaves, and a snowy-white background—this combination will make a lovely cover for the guest room bed. Choose any color combination that harmonizes with your room. Two shades of yellow; a dark and a light red; deep rose pink with two pale shades of pink would be lovely. You might even like to match the shades of your wallpaper, choosing one light and one dark shade of material. 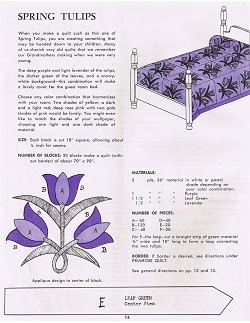 The original quilt was made with a light green back­ground; violet lining, border and large rear petals of pansies; medium green leaves and stems; and lavender printed percale for the 3 front petals of the pansies, (all 3 the same in one flower). 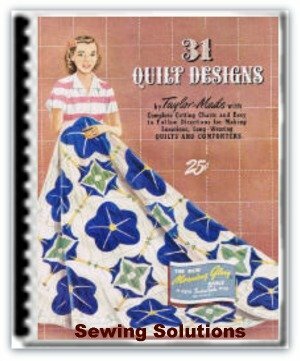 A lively quilt with color and variety will be obtained by using as many different lavender prints as possible (all with designs approxi• mately same size). The prettiest of day's early flowers is used as the main design for this beautiful quilt—the cheer­ful morning-glory. White flowers with purple or lavender centers and green leaves and stems on a lavender background is a very nice com­bination; or use a color scheme to blend with or enhance the appearance of your bedroom or the guest room. The Rose of Sharon design, honored as a "bride's quilt" in the past, is lust as lovely, just as full of sentiment as it was decades ago! Make the appliqued rose of shades of pink and deep rose. 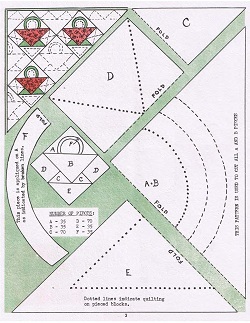 The four leaves, signifying the four corners of the earth, should be of dark green. The bright scarlet of this very showy flower with its green stems and leaves on a white or cream background will make this quilt the center of attraction. 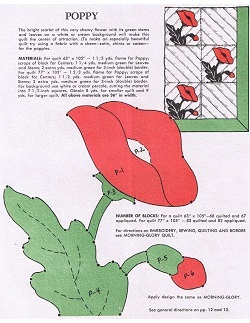 (To make an especially beautiful quilt try using a fabric with a sheen—satin, chintz or sateen—for the poppies. A special quilt for the holiday season—The Poinsettia. 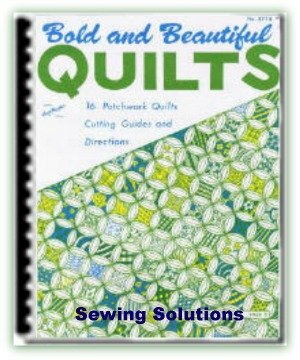 The large red blooms with yellow centers and green leaves on a cream background, and the alternate blocks of dark green will make a really handsome quilt—one that will win you many compliments. (Or if your room calls for a snowy-white quilt make the alternate blocks and background of white percale quilted in small running stitches of green thread. Try your hand at a new color variation with this hand­some flower. Some of the links in the post above are "affiliate links." This means if you click on the link and purchase an item, I may receive an affiliate commission. 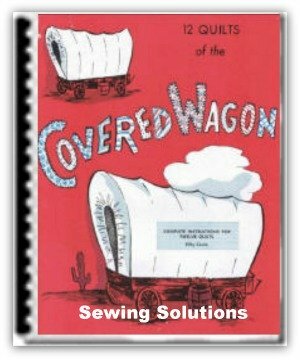 I promise to use it only to send you Sewing Solutions Newsletter.